Strategies focused on real estate and infrastructure, providing a wide range of opportunities across the risk-return spectrum. 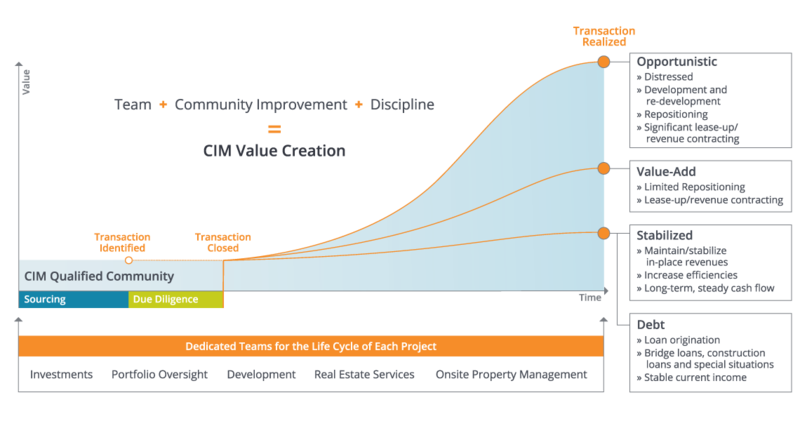 CIM employs a holistic approach to creating value and enhancing communities through real estate and infrastructure. Whether it’s a high-rise office building, a local grocery store or a mission-critical data center, we bring goods, services and employment that support the success of communities. Our Urban Strategies drive real estate and infrastructure projects that serve the needs of urban communities across the Americas. Our Net-Lease strategy focuses on single-tenant industrial, office and retail properties in communities of all sizes with strong demographics. Our objective is to acquire properties that are leased to creditworthy tenants on long-term leases and strategically located along main thoroughfares or near major highways. These opportunities are available to organizations such as endowment funds, pension funds, commercial banks and insurance companies. Opportunistic Strategy: Focuses on acquiring, developing and improving properties in urban communities for stabilization and disposition. Value-Add Strategy: Focuses on acquiring and improving properties in urban communities for long-term investment. Stabilized Strategy: Focuses on acquiring and managing well-positioned and operating properties in urban communities for long-term investment. Infrastructure Strategy: Focuses on acquiring and operating sustainable public goods and services for stabilization and disposition. Debt Strategy: Focuses on securing loans backed by high-quality real estate assets in urban communities. INAV: Within our net-lease strategy, INAV, a continuously-offered non-listed REIT, which focuses on acquiring single-tenant properties leased to creditworthy tenants on long-term leases, is available for institutional investment. These opportunities are accessible to individuals through financial advisors. INAV: Continuously-offered non-listed REIT focused on acquiring single-tenant properties leased to creditworthy tenants on long-term net leases in strategic locations. CMCT Series A Preferred Stock: Non-listed preferred stock in CIM Commercial Trust (NASDAQ: CMCT), which principally owns and operates Class A and creative office properties in urban communities.